Providing you the best range of vga switcher, rgbhv switcher, xga switcher, xga audio switcher and rgbhv audio switcher with effective & timely delivery. 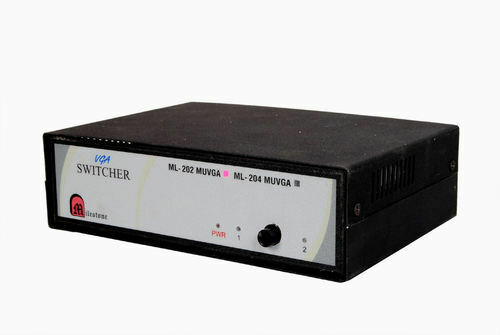 Counted amongst one of the renowned entities, we have come up with a wide collection of VGA Switcher. In compliance with the standards laid down by the universally accepted norms and standards, these delivered switchers are hugely recommended. Apart from this, our customers can buy these products at highly inexpensive rates from us. Simultaneous monitor display output if two monitors are connected at the output. Compatible to multi-sync XVGA, SVGA, VGA, & EGA Monitor. Individual local front panel keypad. Active PCs selected or scanned in auto/scan mode. LED indication for working channel. Other Application where VGA has to be switched. 2 VGA Inputs and 2 VGA Gain Controlled Outputs without RS232C Port / Manual mode only. 4 VGA Inputs and 1 VGA Output without Auto / Scan mode but with RS232C port. 8 VGA Inputs and 1 VGA Output without Auto / Scan mode but with RS232C Port. RGBHV SWITCHER by Milestone is a device that helps person/s to share computers (or laptops) with single projector and single monitor, providing simultaneous displays. 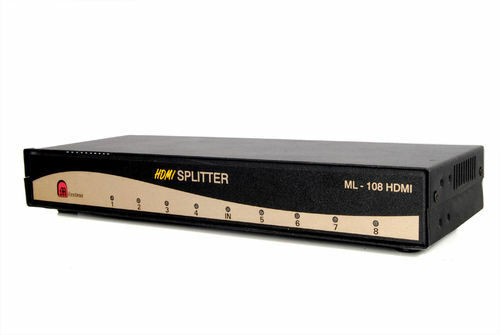 Also it can be used as component video or composite video switcher. 4/8/16 CPUs or display with single projector and single monitor. Fully compatible to RGBHV monitors. Gain control output for optimal viewing. 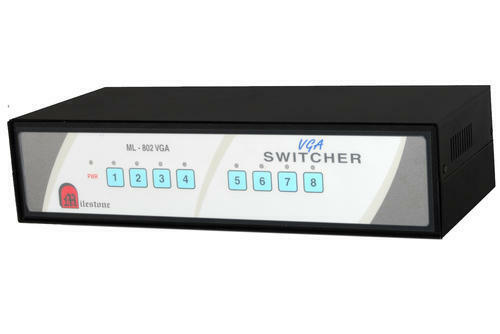 We are remarkable entity, engaged in offering high quality XGA Switcher. 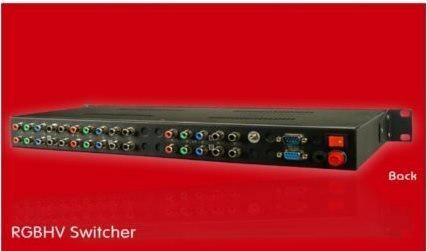 Used in application where VGA has to be switched, offered switcher is manufactured by our proficient professionals from the best quality components and advanced technology in line with industry norms. 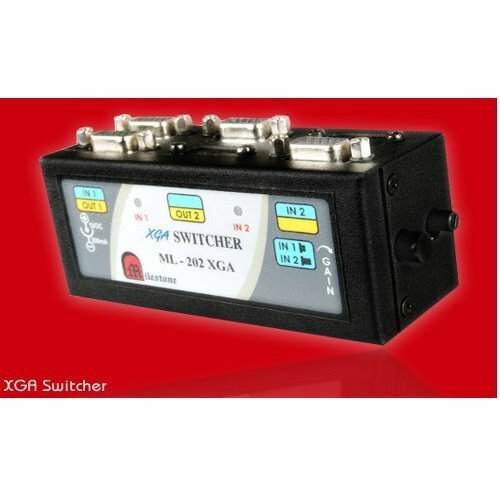 The switcher is user configurable for manual with RS232C or auto scan switching modes. So as to ensure its quality, this switcher is tested on different quality measures. Compatible to multi-sync XVGA, SVGA, XGA, & EGA Monitor. 2 XGA Inputs and 1 XGA Output without RS232C port / Manual mode only. 2 XGA Inputs and 2 XGA Outputs without RS232C Port / Manual mode only. 4 XGA Inputs and 1 XGA Output with Auto / Scan mode but with RS232C port. 8 XGA Inputs and 1 XGA Outputs with Auto / Scan mode but with RS232C Port. 4 XGA Inputs and 2 XGA Outputs with RS232C Port and Auto / Scan mode. 8 XGA Inputs and 2 XGA Outputs with RS232C port, and Auto / Scan mode. 16 XGA Inputs and 2 XGA Outputs with RS232C port, and Auto / Scan mode. XGA AUDIO SWITCHER by Milestone is a device that helps person/s to share computers (or laptops) with single projector and single monitor, providing simultaneous displays with Audio Output. 2/4/8 CPUs with single projector and single monitor & stereo audio system. Fully compatible to XGA, SXGA & EXGA monitors & PC stereo audio output. Standard XGA cables for XGA I/P & O/P. Standard stereo Audio cables (as used with PC ) for Audio I/P and O/P. At par with the norms and quality standards laid down by the industry, we have brought forth a broad collection of RGBHV Audio Switcher. The inputs utilized in the development of these switchers are sourced from reliable suppliers of the industry after strict quality examinations. Apart from this, we guarantee the final delivered consignment is free from all the possibilities of defects. ML 401 RGBHV 4 RGBHV Inputs and 1 RGBHV Output. ML 801 RGBHV 8 RGBHV Inputs and 1 RGBHV Output. ML 402 RGBHV 4 RGBHV Inputs and 2 RGBHV Outputs. ML 802 RGBHV 8 RGBHV Inputs and 2 RGBHV Outputs. ML 1602 RGBHV 16 RGBHV Inputs and 2 RGBHV Outputs. Looking for “VGA and Audio Switcher”?